Tiffany Haley has science in her blood. Her parents planned their family vacations around when total solar eclipses were happening. Last month, the 7th grade science teacher who works at Woodrow Wilson Middle School in Middletown had the opportunity of a lifetime. She was one of four Connecticut teachers and 200 from around the world who won grants from Honeywell Corporation to attend NASA's Space Academy in Alabama. The week-long program was full of inspiring seminars and challenging experiments and simulations. A few Connecticut teachers went to NASA's Space Camp. In one, Tiffany played the role of commander of the Shuttle's orbiter. "There's literally thousands of swtiches in that cockpit and they can tell if you've flipped the switches when you needed to," the Meriden resident said. "You're not only trying to get the shuttle to launch and dock and land correctly, but you're dealing with whatever anomalies they send you." 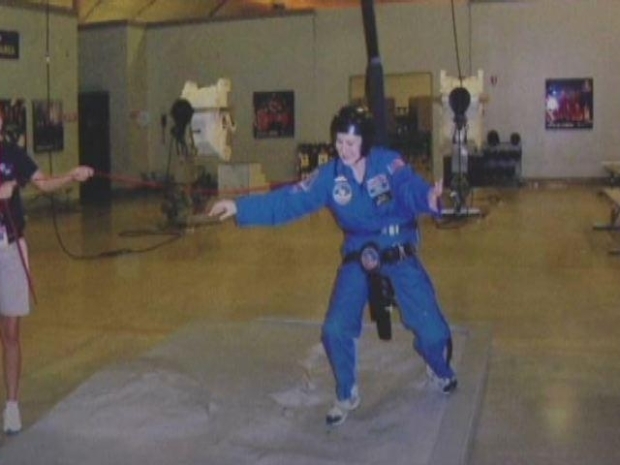 The teachers were put through some basic astronaut training exercises, such as spinning three-ringed, multi-axis trainer and the1/6 gravity chair, which parallels walking on the lunar surface. Dave Cassenti, a teacher at Franklin Academy in East Haddam, attended the program the week before Haley did and said that as much fun as he had in Alabama, he believes the Space Academy is really about what happens next. "Every day, when I was doing stuff, I was thinking 'How can I bring this to the students at Franklin?'" Cassenti said. Both teachers are in contact with their science colleagues around the country and across ther globe. They've set up blogs where they've begun sharing photos and lesson plans for the fall. Tiffany says the NASA experience has re-energized her and reminded her about the true wonder of space exploration. "I think it's important for our kids to know there's a frontier and things to be discovered and possibilities, and if they dream big they can get there," says Haley. Now, she's are poised to help them do it.